Congratulations! You can buy weed in Nevada with zero hassle from the cops. The introduction of legal recreational cannabis in 2017 opened the door to quick and easy sales -- no medical marijuana card required. But there's still a lot of confusion about where you can actually enjoy the stuff. Despite the boom of cannabis culture and tons of dispensaries in Las Vegas, the topic remains a bit complicated. So let's sort it all out with your complete guide to lighting up a fat one in Sin City. Is marijuana legal in Nevada for everyone? Anyone who is 21 and over can purchase cannabis in Nevada for recreational purposes. Just bring a valid government-issued driver's license, ID or passport. It can't be expired and must be scannable to confirm it's the real deal. Is a medical marijuana card still necessary at all? There are still a few advantages to having a medical card. You avoid a retail excise tax of about 10% charged to recreational sales. You also have access to a greater variety of product -- and by "greater variety," we mean stronger. Edibles, for example, can't exceed 100 milligrams of THC per package and 10 milligrams per serving for a recreational sale (with a variance of 15 percent allowed by state law). "Medical patients can purchase in excess of that," says Brandon Wiegand, director of operations for The+Source, which operates dispensaries in Las Vegas and Henderson. "So there are 300-milligram, 500-milligram, or 1000-milligram edibles that medical patients may opt to use." Consult with a doctor about why you might medically benefit from the use of cannabis. Qualifying conditions include cancer, HIV, glaucoma, PTSD, cachexia, multiple sclerosis, seizures, severe nausea, or severe pain. "Chronic pain, nausea, and PTSD are probably the three most common we see," says Wiegand. "Any doctor can write the prescription. It doesn't mean the doctor will write the prescription." From there, you can apply through a Nevada government website portal, which includes a registration fee of $50 for one year or $100 for two years. Add in whatever you paid for the doctor's consultation -- not to mention the overall time and hassle -- and you may realize it's just easier and more cost-effective to stick with recreational sales after all. It probably depends on how much weed you plan to buy in the near future. Will medical insurance cover cannabis for medical purposes? Don't count on it. The DEA still recognizes cannabis as a Schedule I narcotic, which by definition means the medical benefits aren't proven or established. (Hey, it's their view, not mine.) So most insurance companies will tell their customers that medical marijuana won't be covered until approved by the federal government, including agencies like the DEA and CDC. "Generally, insurance is not going to pay for cannabis," says Wiegand. "But I've heard of some flexible spending accounts that have been able to find a way to work around that." Where can I find a dispensary? You've got dozens of dispensaries throughout Southern Nevada with more to come. They're pretty much everywhere, but -- this is big -- not on the Strip itself. "We actually have a law here that you have to be outside the gaming corridor to have a dispensary, even if you're not in gaming," says Larry Scheffler, Co-CEO of Planet 13, the largest dispensary in Las Vegas. "Most of that corridor (spans) a mile either side of the Strip." The main exception to that designation is the industrial corridor, where both Planet 13 and Reef are in easy walking distance from mid-Strip hotels like the Mirage, Wynn, and Palazzo. Essence has a dispensary that's on Las Vegas Boulevard just outside where the Strip ends and the official city of Las Vegas begins. It's near the SLS and Stratosphere, and right around the corner from another dispensary, ReLeaf. Otherwise, weed shops around town will typically require a taxi or ride-sharing service to reach. For the most part, any dispensary in Nevada sells cannabis for both recreational and medical use. However, new applications have already been submitted for recreational-only dispensaries. There are a handful of medical-only dispensaries, mostly in rural counties. How much can I buy at a dispensary? 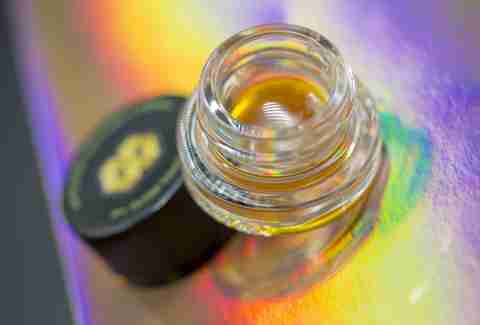 Recreational sales allow up to an ounce of marijuana or ⅛ of an ounce for concentrates like shatter, wax, crumble, and oils. Medical patients can buy up to 2.5 ounces of product within a 14-day period. "Medical sales are tracked. Recreational sales aren't," says Scheffler. "So you can come to our space and buy an ounce, and then go to the dispensary across the street and buy another ounce, (but) the state isn't really concerned about it. They haven't had any of those abuses reported yet." Do dispensaries keep a record of my personal information? No. "We're not allowed to keep information for recreational customers," says Scheffler. "We have to destroy (the record) every 24 hours. We can't report it to the state and we can't keep their information. We can't market to them unless they elect to go into a loyalty program we have." "Legally, no," says Scheffler. "But it happens all the time on the Strip." Consumption is only legal in a private residence. There are no consumption lounges or any other public space where smoking, eating, or ingesting cannabis is allowed. For local residents happy to enjoy marijuana in the comfort of home, this isn't much of a problem. But for the more than 42 million people who visit Las Vegas every year, they face the catch-22 of being able to buy cannabis, but having a place to legally enjoy it -- unless they know somebody with a private home. So it's no surprise edibles, vape pens, disposable cartridges, and other smokeless products are popular with tourists who want to consume cannabis without drawing attention to themselves. "That's why we're looking at being the manufacturer in Nevada for quick strips -- like a Listerine tab -- as a new delivery system," says Scheffler. "You just put it on your tongue and it's in your bloodstream in four minutes." No big deal. I can just smoke in the privacy of my hotel room, right? Eh, not really. A hotel is not a private residence where you can freely smoke weed -- and neither is an apartment if the owner or landlord has rules against it. But let's stay focused on hotels. Most big resorts on the Strip have a casino and no one wants to risk their gaming license by mixing gambling with marijuana, which is still illegal in the eyes of the federal government. Even resorts without casinos on the Strip tend to have strong rules against smoking of any kind in their rooms these days. "It used to be a $500 fine if you smoked in your room," says Scheffler. "Now because marijuana has so many oils in it, some hotels are charging up to $2,000 a day. People are realizing they don't want to get caught in their room, so now they go out in their hallway by the Coke or ice machine and smoke there." "I don't necessarily think those cleaning fees are always justified," says Wiegand. "I think a lot of times, nicotine smoke is much worse -- and produces a lot more tar -- but the reality is cannabis is not allowed. Resorts can charge whatever fees they want." Even if you're not smoking in your room, don't leave your stash laying around. Housekeepers can report any marijuana they find and in turn, hotel management can report you to the authorities if they really want to. But let's be real. If you consume cannabis in a hotel room without bothering anyone else, will you get in trouble? Probably not. Especially if you stay away from products that produce smoke. Just know the rules and consequences -- and use your best judgment. If you want to play it safe, a few smaller non-gaming hotels off the Strip allow smoking in select rooms or from balconies. Whenever in doubt, call a hotel to ask about current policies before making a reservation. Can I consume or sample cannabis at a dispensary? No. Dispensaries aren't allowed to have consumption lounges, tasting rooms, or anything else along those lines. Once a purchase is made, the product is sealed in packaging and you're sent on your way. And don't expect an employee to provide, suggest, or offer a place to consume marijuana. "We make sure they understand the law," says Weigand about his customers. "That's as far as I advise them"
C'mon. Aren't there any kind of consumption lounges in Las Vegas? No. But that will change in the near future. It's just a matter of time. At the moment, the official city of Las Vegas, which controls Downtown (you know, where Fremont Street is), appears to be taking the lead on the matter and could introduce laws to allow lounges as soon as 2019. Clark County, which controls the unincorporated area known as the Strip, is sorting out the matter as well. An idea has been floated for three initial "beta" lounges to see how it goes before allowing others to open. The county may also limit lounges to a zone on either side of the Strip -- since they're not really needed (or wanted) in residential areas. Overall, plenty of politicians and business leaders seem to think lounges are a good idea for the tourists in town -- even the casino industry, who would like to keep cannabis use off their properties. It's just a matter of sorting out the details -- like if booze should be permitted as well. "The hotels, oddly enough, have embraced having consumption lounges, because they know they have a problem with people using the rooms," says Scheffler. Can I buy marijuana while on vacation in Vegas and bring it back home with me? Unless "home" is somewhere else in Nevada, the answer is a hard no. It's against federal law to carry cannabis across state lines -- even to another state where cannabis is legal. So if you're on a road trip between Nevada and California, it's illegal to cross the border with cannabis, even though recreational use is allowed in both states. If you show up to McCarran International Airport in Las Vegas, you can unload any leftover weed in "last chance" disposal boxes no questions asked. Carrying cannabis beyond the TSA checkpoint is federally illegal, even if you're flying inside the boundaries of Nevada between Vegas and Reno. I get it. Pot is legal in Nevada. But is there still any way to get arrested for possession? If you're caught purchasing on the black market, that's illegal possession. Even if you make a purchase from a legit dispensary, you can still get in trouble if you're carrying more than an ounce of marijuana (or 2.5 ounces with a medical card). On the extreme side, if you're caught with more than 50 pounds of weed, you're facing a felony trafficking charge and possible jail time -- or deportation if you're not a citizen. Just like alcohol, you can be charged with driving under the influence of marijuana. So don't get behind the wheel when you're high. And just like alcohol, you can face an open container violation if you're in a car and your cannabis isn't in a sealed container. To play it safe, don't unwrap your dispensary purchase in the car. Wait until you get to your destination. The safe bet -- go with Blackbird, a legit service that works directly with licensed dispensaries and charges $1 per mile with a $10 minimum. Otherwise, keep it simple and contact a dispensary directly. Keep in mind, delivery is restricted from any gaming property, including hotels on the Strip or bars with video poker machines. Can you order marijuana through a delivery service? Yes, but if you want to stay on the right side of the law, be careful. Illegal delivery services are popping up across Nevada, although you may prefer the legal route anyway. The advantage of buying regulated weed means you can always trust what you're getting. "If you see an ad on Craigslist and they're not confirming your ID prior to purchase, or making sure you have a medical card if you're purchasing medical product, it's a pretty big red flag you're dealing with somebody who's not operating to the letter of the law," says Wiegand. Can you grow marijuana in your own home? Yes -- with qualifications. If you don't live within 25 miles of a dispensary in Nevada, you can seek approval to grow your own marijuana for medical purposes. If you were already growing prior to 2013 under the medical program, you may be able to continue to grow. If a dispensary has limited product not specific to your needs, allowances could be made to allow you to grow. How has cannabis culture merged with Las Vegas culture? 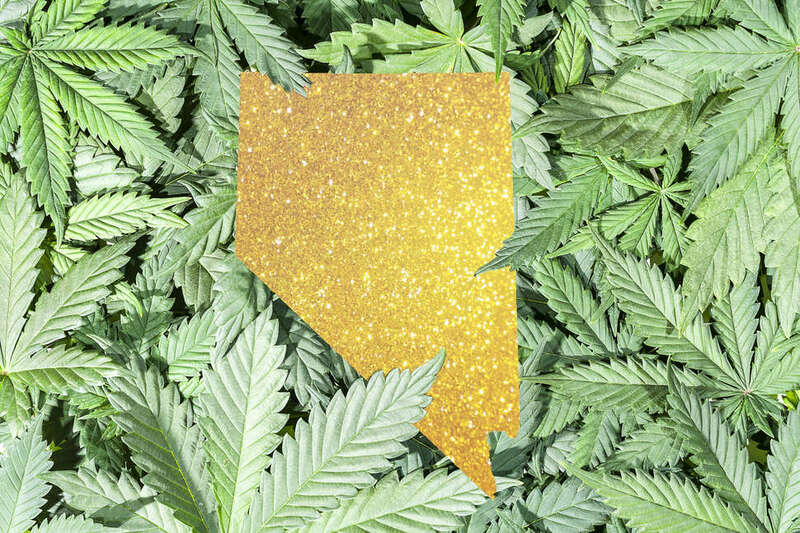 It's safe to say Nevada has embraced the cannabis industry for its medical and economic benefits. Politicians across the board, and sometimes across party lines, have shown their support, including incoming Governor-elect Steve Sisolak. In turn, Las Vegas has put its own stamp on cannabis culture. Trade shows like MJBizCon and tour companies like Herbology Tours draw out-of-towners who want to learn more about the industry. On the other hand, Cannabition is a first-of-its-kind art museum dedicated to marijuana, where guests are encouraged to snap Instagrammable photos of themselves with the exhibits. Dispensaries no longer hide in the shadows. They're becoming tourist attractions in their own right. 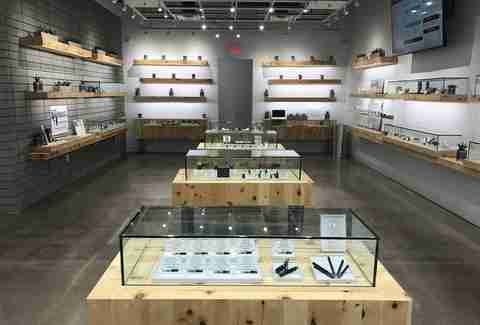 The best example is Scheffler's 112,000-square-foot Planet 13, billed as the first cannabis superstore in Las Vegas. It features interactive elements, ranging from 15-foot-tall dancing flowers on the roof to an aerial drone performance every hour. "We trying to go over-the-top," adds Scheffler. "We want to have a club like they have at the hotels. We have 65,000 rooms overlooking our site, We want to have an outdoor patio and a splash pool six inches deep where people can take off their shoes and dance in the water." Other dispensaries that heavily cater to tourists on the Strip include Acres, where a hallway is dedicated to exhibits representing the history of hemp, and the Apothecary Shoppe, where edibles are crafted with a gourmet touch by a pastry chef who formerly worked in fine dining restaurants. What does the future hold in store for the marijuana industry in Las Vegas? Short term, it's a wait-and-see approach when it comes to public consumption lounges. In the long run, Scheffler says big changes will happen if and when the federal government declassifies cannabis as a Schedule 1 narcotic. "The big boys -- Big Pharma, Big Tobacco, and Big Alcohol -- will be looking at the five biggest guys in each state and will be buying them out," he predicts. "There will be a lot of consolidation going on." Regardless, Wiegand believes Nevada will continue to be an example for how a state can regulate its vices. He also sees potential for cannabis to crossover into the deep culinary scene in Vegas. "There's certainly an opportunity down the road for some kind of cannabis restaurants," he says. "The market for cannabis is only going to grow and expand as it becomes more normalized and destigmatized." Rob Kachelriess has been writing about Las Vegas for Thrillist for more than five years. His work has also appeared in Travel + Leisure, Leafly, Supercall, Modern Luxury, and Luxury Estates International's seasonal publication. He's never been charged a hotel room cleaning fee. Follow him on Twitter @rkachelries.